I’ve never eaten a less crispy pizza in my life. This post is filed under Cheese, Frozen, Oven, Pizza, Tomato Sauce, Tony's. In my opinion pretty much any frozen pizza can be fixed with a bottle of Tabasco….but then in reality it’s a bottle of Tabasco topped with some pizza. ^Agreed with Eating on the Road. Also, did you place the pizza directly on the oven rack as instructed? This makes for a very crispy pizza.. 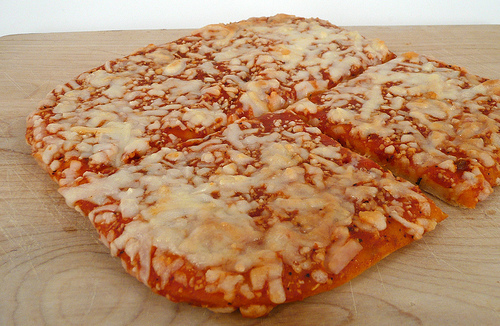 I actually had one of these pizzas from lunch today, and I disagree with your chewy statement. I baked mine in the toaster oven and it was quite crispy. I must disagree with your “Looks” rating. My impression is that your photo is of an unbaked pizza. As for taste — my niece loved it — when she was in third grade. I’m pleased to say her tastes have grown with her height. I’m a huge sucker for frozen pizzas. They taste nothing like real pizza. But for me, I’m not going for an actual pizza experience. Similar in that a Jolly Rancher green apple candy tastes nothing like an actual apple. Frozen pizzas are they’re own food group. And I highly recommend a pizza stone for frozen pizzas. You’ll get that crispiness you’re looking for. 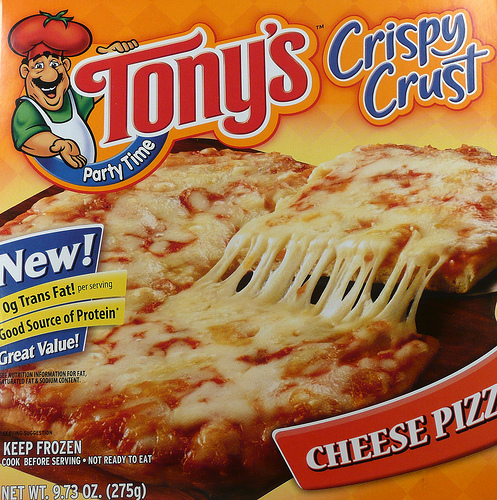 I love Tony’s pizza! It’s cheaper than buying dough, so I just put lots of mozzarella cheese and toppings on it and bake it like that. It comes out awesome. Cheap, yummy dinner! I have to admit, though, it isn’t crispy at all, lol.